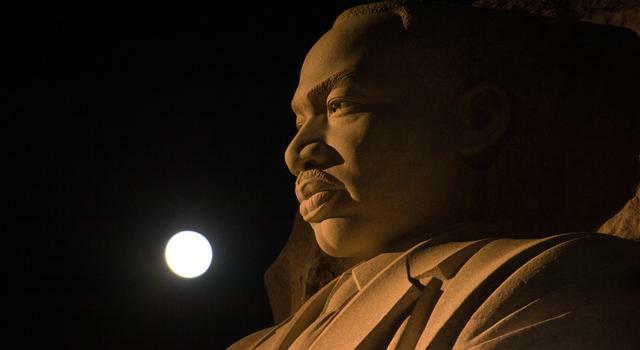 This activity is related to a Teachable Moment from January 2018. See "Explorer 1 Anniversary Marks 60 Years of Science in Space." This lesson provides students with an understanding of satellites, their use and structure, and power systems. In this potentially multi-day activity, students will use the engineering design process to design, build, test and improve a model satellite. The satellite must meet certain instrumentation criteria and robust constraints in order to successfully overcome vibration testing. Assemble a weakly-designed, partial model of a satellite in advance of teaching this lesson. This model will be used to demonstrate the potential detrimental effects of the shake test. Provide students with a variety of materials they can use to build their models. Encourage students to sketch their initial design ideas in their engineering journals. Emphasize that design sketches are informal and do not have to be highly accurate. Their final design should be represented in a reasonably accurate two-view sketch on the student worksheet. NASA missions collect scientific data to help scientists and engineers better understand the features and environment of Earth and other planets and objects in our solar system. These missions inform future exploration. Those at Mars will ultimately help NASA determine the best locations for future human exploration and Mars bases. Each mission gathers data that inspire more questions — questions scientists hope to answer using scientific instruments on board robotic explorers. NASA sends three types of robotic explorers into our solar system: satellites, landers and rovers. Satellites, fly-by or orbiting spacecraft, explore the features of a planet from a distance, making observations of large swaths of the planet. Landers make observations on their landing spot and do more in-depth science at one location. Rovers make in-depth observations at a variety of locations within their driving range. Each type of robotic explorer has its merits and is used for different purposes depending on the planet being observed and the types of observations desired. All robotic explorers have some parts in common, including the main bus (body of the spacecraft), a communications antenna and a power system. The main bus can be of any shape and contains the primary electronics and computer modules for the spacecraft. Antennas commonly used are low-gain antennas and high-gain antennas. Low-gain antennas often look like short flag poles and communicate at a low data rate. High-gain antennas are parabolic in shape and generally communicate at a higher data rate. They are especially useful for communicating with Earth from a long distance. Solar power systems are often used for spacecraft at Mars because Mars is close enough to the Sun to make solar collection efficient. 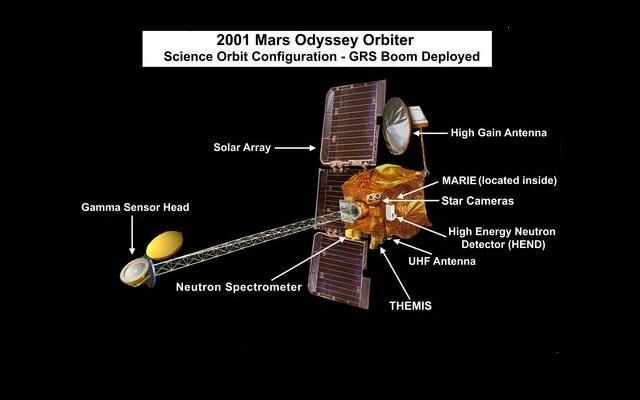 Occasionally, Mars spacecraft use radioisotope thermoelectric generator power sources. Mars satellites currently employ solar power. This lesson focuses on satellites, orbiting observatories that provide global context and inform future lander and rover missions. Satellites carry instruments (sometimes called “detectors,” “probes,” or “sensors”) to make their observations. Satellite instruments can provide detailed maps and images of surface features that help engineers and scientists decide where to land the next rover or lander. Satellite instruments can also perform a variety of science experiments including spectral analysis, gravity measurements and radar observations, just to name a few. Spectral analysis, or the study of the light emitted or reflected by various surface materials, can be used to characterize surface materials. Gravity measurements can give scientists clues about the density of the various materials the satellite is flying over. Radar can provide information about surface features by way of reflectivity, and it can also penetrate the ground to determine subsurface features such as cracks and voids. 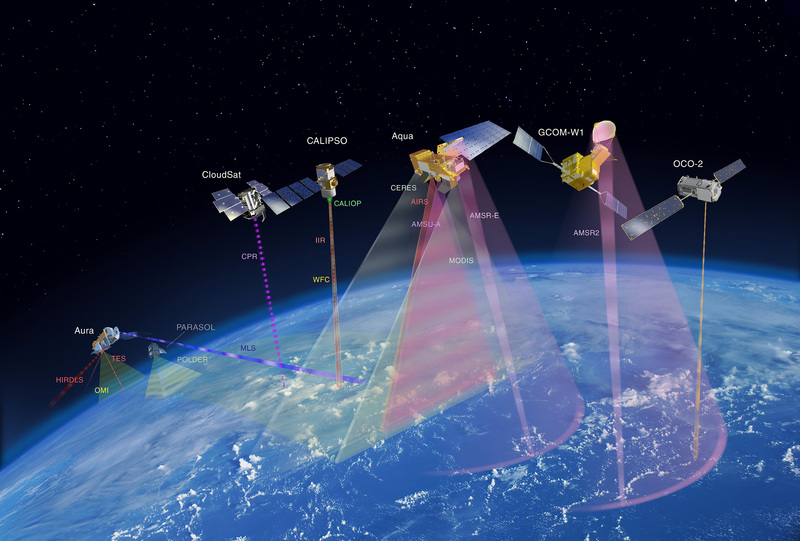 NASA and its international partners operate several Earth-observing satellites that closely follow one another along the same orbital “track.” This coordinated group of satellites is called the A-Train and its near-simultaneous scientific observations play a key role in advancing our knowledge of Earth science and applying it for the benefit of society. Each instrument is designed, tested and assembled by different teams of engineers and scientists. The instrument teams must work with the main satellite design team to ensure instruments are the right mass, fit correctly and sustain environmental testing. Once a satellite is built, it is tested for its ability to sustain the vibrations of launch. If it fails this test, the satellite must be redesigned. A NASA vibration test is conducted on a shake table, a device to which the satellite is attached and shaken back and forth, simulating the forces that will be encountered during launch. Additional environmental testing, including thermal and acoustic testing, is also conducted on spacecraft. For this activity, students will simulate vibration testing only. Assess students’ prior knowledge by asking them what a satellite is, what satellites look like, what they do and what we use them for. 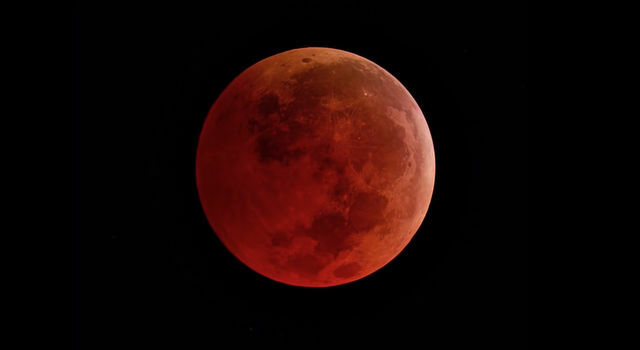 Discuss the similarities and differences between natural satellites such as the Moon and human-made satellites such as GPS, communications, weather and planetary exploration satellites. All satellites orbit a celestial body. Show this video as an example of an Earth-orbiting satellite. Show students images of satellites from the materials list or from NASAʼs Eyes on the Solar System. Explore different satellites, what they do and what they look like. Note that satellites orbit or fly by an object, but they are not designed to land. Explain the main parts of a human-made satellite and point out examples: main bus, power system, science instruments, communication antennas. 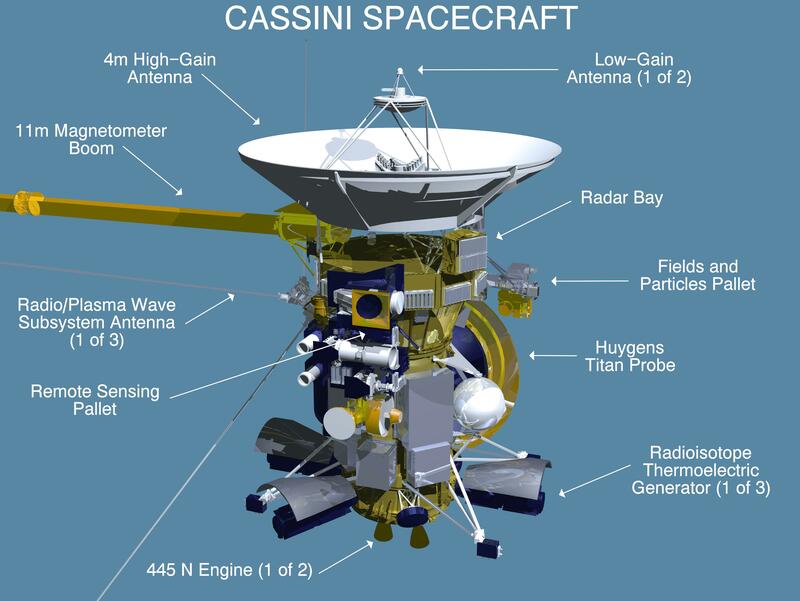 Two example satellite images that clearly shows all of these parts are the Cassini spacecraft and Mars Odyssey. Explain to students that they are going to work in teams to design and build a model of a satellite that will orbit a planet. The teacher may specify which planet for unity or allow students to choose their own planet for variety. Show these videos about building satellites and discuss some of the challenges shown in the videos. Show students the available materials. Explain that their finished product, just like a real satellite, must fit inside a rocket fairing (represented by the oatmeal canister or mailing tube) for launch. Explain that their satellite must include all the main parts of a satellite (main bus, communication antenna, power systems, etc. ), including at least three science instruments, two of which deploy (pop out or unfold) upon release from the rocket fairing after launch. The goal is to include as many science instruments as possible in order to achieve the most science return (as noted by “science value” on the student worksheet). Explain that the total simulated mass of the science instruments, communication antennas and power systems must be no more than 60 kg. Each component can be represented by the simulated mass measurements noted on the student worksheet. Explain that a lot of vibration occurs during launch and their satellite models must be able to pass a shake test upon build completion to verify that they will survive launch. Show this video of the James Webb Space Telescope shake test. Demonstrate how to conduct a shake test. Use a poorly-built simple model of a satellite that will suffer some damage during the shake test. In order to encourage student design, do not use a fully built satellite model. Instead, consider using a model that has only one component attached, such as the solar panels. Shake the satellite model by moving it rapidly back and forth over a distance of 15 cm. Move at a rate of approximately 30 cm/s, so each back and forth movement will take one second. Do this for 15 seconds. Explain that each completed satellite model will be assessed by another team using the quality assurance worksheet. Review the quality assurance worksheet with the class. Instruct teams to choose team names appropriate to the project. Instruct teams to commence brainstorming about the design of their model, completing the mass table on their worksheet and sketching their ideas. Instruct students to have their final sketched design approved by the teacher. Once the design is approved, have teams construct their satellite model. Once construction is completed, have teams pair up and complete the quality assurance form by examining the spacecraft for size and component compliance and conducting a shake test. Have students make repairs and retest satellite models as needed. Bring the class back together to present satellite models and findings from environmental tests. Each group should make a short presentation explaining the functionality of their satellite and the outcomes of the quality assurance review. Ask students to discuss the process they followed while designing and constructing their satellite models. They likely followed steps similar to those in the engineering design process. After they have described their steps, introduce the engineering design process and explain that this process is what engineers follow to solve all sorts of problems. Point out that the students’ natural tendencies to try and test solutions then redesign or improve their ideas are in line with the engineering design process. Ask students to discuss the impact of the constraints of this project. If they had more time, what would they do differently? If they had different materials, could they improve their design? If they had a larger mass allowance, how might that impact their satellite design? Have students build a launch vehicle for their satellite. Use the lesson Heavy Lifting as a guide for lifting payloads into space.